Beautiful city near Paris, Chartres is internationalyfamous for its Cathedral registered at the UNESCO worldwide heritage. Strolling in the City center you will fall on artisans or antique dealers old shops fronts, enter in and you will discover a large range of unique and unconventional items that will enhance your journey there. 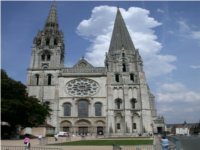 Going to Chartres you should dedicate a few hours to visit the Cathedral which is going to blow your mind with the radiance of its stained glass and all the city’s history beyond this monument. At the heart of the cosmetic valley, Chartres is known for being the first worldwide center of perfume ressources. Indulge yourself to the discovery of new scents in a city with no shortage of light, scent of charm. If you want to do shopping in Chartres why not start by the market places. Twice a week from the stalls of the market for flowers to the manufactured goods market' stalls you can find everything you want. For the most demanding if it if not enough you can try the second-hand dealers shops, or the antiaues dealers one or the artisans ones to come back hone with great and uniaues souvenirs from your trip there. As Chartres is a dynamic city, during all the year there are different events, festivals etc. The « Chartres en lumieres » festival is one of the most important with a presentation of the 30 monuments in light and music.